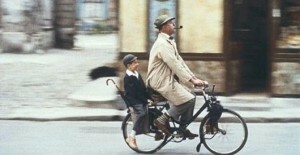 This Oscar-winning French comedy (below)– about the exploits of Monsieur Hulot, his tiny nephew, and his struggle with modern architecture – is introduced by Professor Robert Kronenburg PhD RIBA, Roscoe Chair of Architecture at Liverpool University School of Architecture. This touring exhibition was originally created for FACT Liverpool by Re-Dock and young people from Burnley, Wigan and Hull. Expect the dystopian idea of “artefakes”: objects carefully selected by curators from the year 2065, after a nuclear explosion changes the world… See it until Sept 2017. 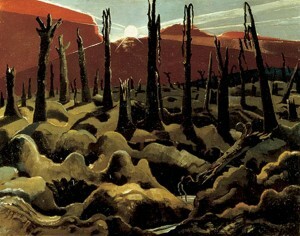 Known for his iconic Second World War paintings (below) – using sensual shapes and rich colours to depict bomb-battered landscapes – learn more about one of Britain’s most interesting modern artists in this expansive retrospective. Californian girl gang WARPAINT launch nine days of contemporary and progressive international music in the city; from live soundtracks by visionary US film director John Carpenter (28/10, The Olympia); to psych-pop from Wirral band She Drew The Gun (30/10, Leaf), who’s single Poem was described by BBC DJ Steve Lamacq as “the most powerful song I’ve heard this year”. Until Friday 4 Nov.
Two 1960’s dramas starring the excellent Earl Cameron tonight, which carry messages about race and abhorrent human behaviour that still ring true today. 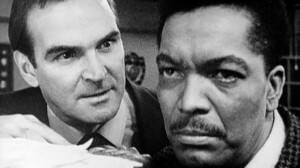 In director Herbert Wise’s battle of wits and resolve, A Fear of Strangers (below) has Stanley Baker playing an inspector wanting to convict Cameron’s black musician of murder. In Edward Albee’s play, The Death of Bessie Smith, America’s Deep South comes under the microscope as Cameron plays dying blues singer Bessie Smith: denied treatment at a “whites-only” hospital. 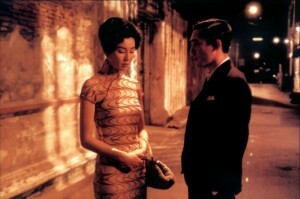 Part of the BFI’s Black Star Season. Liverpool’s newest art space, situated on Water Street, and with an impressive archive and tiny (cheap) bar, is aiming to encourage a bit of relaxed debate. Tonight, expect Tate Liverpool curator Darren Pih and Italian writer Vincenzo Latronico to discuss the commonly used term Intellectual Property, and what it actually means to artists, including to Yves Klein: currently on show at Tate Liverpool, and who famously patented his very own pigment, International Klein Blue. 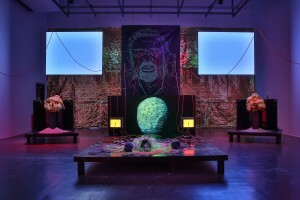 Space tourism, as seen through the eyes of contemporary artist Benedict Drew (below): Richard Branson depicted as a day-glo demigod; soaring Virgin spacecrafts accompanied by a saxophone; a psychedelic presentation of – as Drew sees it – “the horrors of the modern world”. Part of the Arts Council Collection 70th anniversary celebrations, see it until 26 Feb 2017. 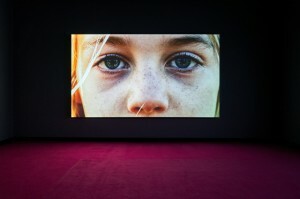 As with BFI’s critical film screenings this week, artist Keith Piper addresses contemporary anxieties about race and class, but via contemporary art; his new solo exhibition presents a fictional archaeological dig set years in the future. Also part of the Arts Council Collection’s 70th anniversary celebrations, expect new films, apocalyptic fiction, and an insight into Piper’s political practice. 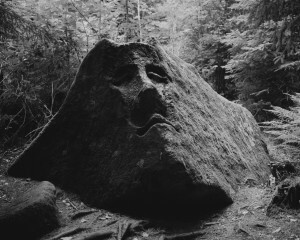 See the 2015 award winners, and their subsequent new work: including Matthew Finn, who has been photographing his mother in a series of collaborative portraits since 1987; Joanna Piotrowska’s portraits of young women recreating poses from self-defence manuals; and Tereza Zelenkova’s (below) eerie photographs exploring folklore in the Czech Republic. Until 18 Dec.
A brand new festival featuring entertaining live readings and audiences with poet Lemn Sissay (29/10, VGM), and author and journalist Colm Tóibín (30/10, St Georges Hall); in addition to novelist Frank Cottrell-Boyce (30/10, VGM) on the influence of Bowie’s favourite books, and an adaptation of Mary Shelley’s Frankenstein (28&29/10, Everyman) by bestselling children’ s author Philip Pullman… An impressive launch event and one which we hope will be an annual addition to our calendars. Until 30 Oct. 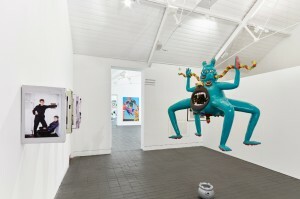 Using children’s TV, emojis, bored computers and fairytales to examine the murky boundary between childhood and adulthood, contemporary Scottish artist Rachel Maclean (below) presents all new work at HOME; expect hallucinogenic films, drawings and stills, and a monograph by the artist plus William Davies (author of The Happiness Industry), Melissa Gronlund (writer and co-editor of Afterall Journal), and exhibition curators Bren O’Callaghan and Sarah Perks. Until 8 Jan 2017. Italian contemporary dance troupe Company Blu have been this week workshopping with dancers and non-dancers alike, from around the North-West area, to produce a brand new show of dance, reading and actions. Expect 25 years of expertise that has seen the company perform at Dance Venice Biennale and the Rotterdam Festival. Gear up for Halloween with this joyously ghoulish (and silly) double bill of Japanese cinema. First up: Hideo Nakata’s infamous Ringu (Ring), in which a horrible haunted videotape causes a spate of mysterious deaths… And in Hausu (House; video, top of page) – for the making of which director Nobuhiko Obayashi consulted his 10-year old daughter – expect a psychedelic cult classic from the studio behind the Godzilla movies. Boo!